Mobilize Mail occasionally hears the horror stories of websites being hacked and remaining offline for days, weeks and often longer. Marc our IT chap in the know has written an eBook with the small business website owner in mind. Kiwis we are a trusting lot and this trait was evident in abundance during the GFC (Global Financial Crisis). Many Kiwis entrusted key financial decisions and large sums of money (in some cases their entire savings) with Financial Advisors and the like only to lose the lot. This trusting trait is also evident in business website management and control thereof. Many of us are quite happy to leave it all with someone. Therefore third party contractors often have sole access to a business’s website assets. Clearly this is ideal and hence many businesses come unstuck when disaster strikes. This eBook lets you know why you need to be in control of your website and how to create a disaster recovery and website maintenance plan to ensure your website is maintained and if it is taken offline the downtime is as short as possible. 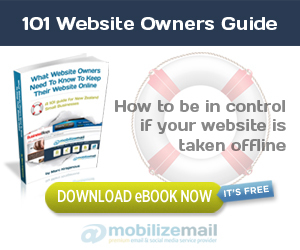 This eBook is not suggesting you do the website work, only that you be in control of the process.